John Oldland. An abstract of 1888 says that before the Fewsters owned the property that is now 6 Castle Street in Thornbury it was occupied by John Oldland. John Oldland appears in the Land Tax Records for 1800. He rented a house from Edward Thurston which we believe later became known as 6 Castle Street. We cannot be certain who John Oldland was. It is not a common name and so an inscription in St Mary’s churchyard in Thornbury might provide a clue. The inscription says “In loving memory of BETTY OLDLAND wife of John Oldland of this parish and daughter of Robert and Mary Hathway of Pucklechurch, in this county who died February 24th 1804 aged 47 years. Also in memory of MARTHA daughter of the above who departed this life September 11th 1831 aged 55 years.” It is possible that John and Betty Oldland occupied this house. Sarah and Mary Smith. The 1841 census appears to show that the occupiers of 6 Castle Street in Thornbury at that time were Sarah Smith a corset maker aged 24 and Mary Smith a dressmaker aged 18. They seem to be living with Mary White a 25 year old shawl and bonnet maker and two other ladies ,one a Miss Sperrin 40 years old and independent means and the other Miss Parsons, a 50 year old bookseller. James Harding. An Abstract of 1888 refers to the fact that James Harding lived in this property after George Fewster and before George Fry. The only James Harding of whom we have a record died in March 1851 aged 82. It is possible that this is the same person but we have no other information at this time. Robert Jordan. When the new Council School was opened in 1863, its first Master and Mistress were Robert Jordan and his wife Sarah (nee Basset). Robert was a ‘certified teacher of the third class.’ It was common practice in Victorian times to appoint a husband and wife team. Both the two successors to the Jordans were appointed to this post on that basis and even after them the wife of the Master of the British School (later the Council School) became involved at the school during the first twenty years of its existence. The Jordans were both born around 1816. Robert and his wife were master and mistress of a school at Green Hill, St Clement in 1841 and then in a school in Heigham in 1851. In 1861 the Jordans returned to Robert’s birthplace of Worthing but although Robert was still a schoolmaster, his wife was the laundress of the laundry they were living in. By 1865, and possibly from the time they came to Thornbury the Jordan family lived at the house that later became 6 Castle Street. Their daughter Isabella Mary died on 10th May 1863 aged 22 years. The Jordans moved from Castle Street to live at the top of Thornbury High Street in what is now Townsend House (81 High Street). The rate books of 1867 and 1869 show that they continued to live in the High Street. They had three other children, Catherine M, Herbert H, Archibald and James Theophilus. In the 1871 census Townsend House was said to be occupied by Robert Jordan aged 54 and school master of the Council School – described here as the British School. His wife Sarah was 55. Both husband and wife were from Worthing. Their daughter Catherine Matilda was also a teacher and born in Rosewick St Clements. Catherine became an assistant teacher at the school for a short time and thereafter deputised for her mother at various times. The 1876 rate book lists Robert Jordan as the occupant of 11 Pullins Green. In September 1879 Robert Jordan resigned as Master of the British School and returned to the Worthing area. In 1881 Robert was still a schoolmaster but did spend some time that year as a patient in St George’s Hospital in Hanover Square, London. Sarah was described in the Census as a retired teacher and the household was completed by a son James, granddaughter Isabella and Sarah’s brother, Henry Basset. Sarah died around 1891 aged 75. Robert retired and is thought to have died in the latter part of 1892 aged 77. The rate book of 1867 shows that Ruth Taylor occupied this house. She was a grocer at this time. In the 1871 census the occupier of Oriel Cottage was Ruth Taylor. Ruth was the daughter of Betty Taylor who ran the White Hart Inn in Olveston. The 1851 census shows that at that time she was aged 27 and living with her widowed mother Betty, 24 year old sister and a brother called Joseph aged 18 who helped his mother in the pub. They had two lodgers John and Eliza Gilbert also living in the house. The 1861 census shows that Ruth remained with her mother and by this time they were living alone in the White Hart at that time, apart from a 20 year old servant Sarah White. After her mother’s death in 1865 she moved to Thornbury to live with her Aunt Sarah Beard. By 1871 the census shows that Ruth was living in Thornbury in the house that became 6 Castle Street. In 1881 she was still trading as a grocer and living in the same house in Castle Street with her 15 year old niece Emma Taylor. We have been told that the shop she ran was also a sweet shop. By the census of 1891 Ruth was aged 68. We have been told she complained of loneliness. She had left Thornbury to live in nearby Alveston with her 72 year old widowed sister Eliza Cornock. A member of the family has told us that he understood that Ruth suffered from sort of dementia and was cared for by another niece Laura Willcox for the latter part of her life at Laura’s home, Newton Lodge in Rockhampton. Ruth Taylor died in Thornbury on 19th May 1903 aged 80. We believe she was buried in Oldbury churchyard. 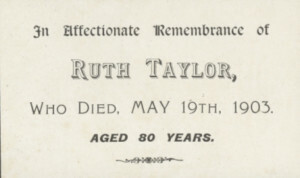 It is interesting that we have a memorial card for the death of Ruth Taylor but it was addressed to Miss Taylor of Castle Street which implies that Ruth Taylor had a niece living in the house at that time. We apologise for the quality of the photograph above on the right but sadly it is all we have of Ruth Taylor. Emma Bartlett – she bought 6 Castle Street from Ruth Taylor in April 1888. The 1890 rate book shows that Nathaniel Bartlett owned and occupied 6 Castle Street. This is probably inaccurate as we do not believe that Nathaniel Bartlett ever owned the house. Emma was born 13th June 1850 and baptised 14th July 1850. She was the daughter of Rhoda and Nathaniel Bartlett. The Bartlett family lived at the bottom of Castle Street for many years. In 1861 the family was living in one of Stokefield Cottages. The 1871 census shows Emma was working as an ‘Under Maid’ at Clifton Ladies College. In the 1881 census she was a cookworking for an architect, Joseph Wood, at 3 Exeter Buildings, Westbury on Trym. In 1891 the census confirms that Nathaniel Bartlett and Rhoda had moved up Castle Street to Oriel Cottage, number 6. By this time Nathaniel was 71 years old and Rhoda 73. They were living with their 40 year old daughter Emma. The Continuation of the Abstract dated 1896 shows that it was Rhoda Bartlett who bought the house out of her own property from her daughter Emma in July 1891. The rate book of 1894 shows Emma Bartlett as the owner and occupier. This is not necessarily evidence of who legally owned the house but confirmation that the Bartletts were still there. Rhoda Bartlett died 20th October 1895 aged 78. Neither Emma nor Nathaniel Bartlett appeared as the owner of property in Thornbury in the Rate Book of 1899. Nathaniel died 22nd March 1900 aged 80. Emma Bartlett married Robert Phelps on 12th December 1898. Robert was a widower and had a hairdresser’s and tobacconist’s business on The Plain. Robert died almost exactly a year later. Emma ran the business with her step-daughters. She died in 1907 on February 3rd. It appears most likely that this was the period when part of this property was used as a doctor’s surgery by Dr Williams and then by Drs Williams and Prowse working together. Dr Prowse’s daughter, Hilary Newton can recall the surgery at number 6 and “helping” there to dispense the medicines. Later, after Dr Williams retired, the surgery was moved to number 20 Castle Street. Eric Malpass. We have been told that it is possible that Eric Frank and Kathleen Annie Malpass may have lived in this house. It seems that when Richard Malpass was born in 1937 his parents could have been living at this house. We know that in 1917 Eric Malpass was living with his sister and brother in law Lillian and George Taylor at what is now number 36 Castle Street. It is possible that Eric later moved into 6 Castle Street, perhaps after his marriage to Kathleen Annie Phillips on 20th February 1936. However if this is the case the electoral rolls show that Eric and Kathleen had moved to Eastland Avenue by 1938. Edward and Joan Bryars. We know from Mrs Riddiford, a resident of Castle Street that number 6 Castle Street, which was also known as Oriel Cottage, was occupied by Edward and Joan Bryars from the 1940s to around 1980. Mrs Riddiford said that Edward (Ted) Bryars was a butcher for Trayhurns a well known business on The Plain in Thornbury. We understand that Mr and Mrs Bryars rented the property. The electoral register confirms that Edward and Joan Bryars lived at Oriel Cottage in Castle Street. Edward Bryars was born in the Gloucester area on 25th March 1911. He married Joan Boyt in Thornbury in the June quarter of 1935. She was born in Thornbury on 10th November 1913. She was the daughter of Herbert Boyt and Caroline Clements who married in 1907. We do not know where she grew up but her mother lived at Grovesend in later years. We do not know when Edward moved to Thornbury but there is no record of him in the electoral registers until after his marriage. In 1938 the couple were living at a house called “Wroxham” at Gillingstool. Their son Robin Edward Bryars was born on 30th June 1946 and was baptised on November 17th. The family’s address by that time was Oriel Cottage. The record shows that Edward Bryars was indeed a butcher at that time. The electoral registers show that Edward Bryars lived in the house until at least 1975 and Joan Bryars until at least 1980.